If you’re looking for a gift for someone who has everything, then Donald Russell is worth looking at. Based in Aberdeenshire, Scotland, Donald Russell is a mail order and online butcher that sells delicious, tender meat. Perfect for the BBQ season, the wonderful range of Donald Russell meat is the ideal gift for meat lovers who want a gift that is a little bit different. Their meats are beautifully flavoursome and are extremely tender, and will be thoroughly enjoyed by the recipient. I received a Donald Russell package and was very pleased with the meats I received. They were delivered individually packed and frozen so all I had to was put the products I did not want to eat that same day in the freezer and place the products I wanted to eat that day in my fridge and let them gradually defrost. The selection of meats I received were: 2 packs of BBQ Pork Shoulder Steaks, 2 Packs of Lincolnshire Sausages, 2 packs of Chipolata Skewers and a pack of Spiced Lamb chops. I tried the BBQ Shoulder Steaks the same day and they were absolutely delicious. Once they had thawed, I followed the instructions on the pack and cooked them for dinner. The shoulder steaks were extremely tender and the BBQ sauce they were marinated in was wonderfully flavoursome. They were a big hit in my house! 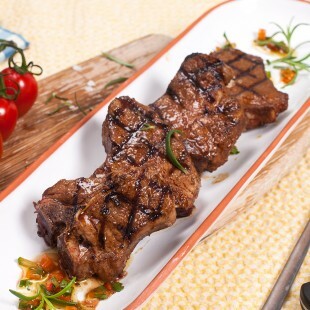 The RRP for the BBQ Shoulder Steaks is £9.00 for four steaks. The Lincolnshire sausages were also delicious. 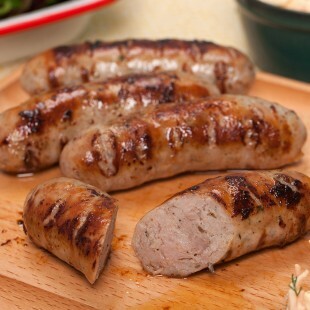 These meaty sausages are seasoned with nutmeg and sage and taste divine. They are priced at £6.60 for eight sausages. The Chipolata Skewers and the Spiced Lamb Chops were also loved in my house and my family really enjoyed the meals I had made for them. The Chipolata Skewers are priced at £11.00 for four skewers and the Spiced Lamb Chops are priced at £6.50 for four chops. There is such a wide range of meats on the Donald Russell website that you really will be spoilt for choice. If you are purchasing the meats as a gift then you will definitely find the perfect selection for the recipient. But, if you would like the recipient to choose their own selection, gift vouchers are also available to purchase. The gift vouchers are available in £10 denominations up to £50 and the vouchers are sent directly by email so you can personalise the message to suit the lucky recipient. Donald Russell also sells kitchenware so you can purchase gifts for the kitchen as well, such as a beautiful chopping board or a selection of steak knives. To see the full range of meats, kitchenware and gifts visit www.donaldrussell.com.